Residents are generally liable to pay tax on their worldwide income but individuals who reside in Belize but are domiciled elsewhere are only subject to tax on their Belize-sourced income. Married couples are taxed separately. Income is classified according to sources and is taxed accordingly. Income tax is levied at a flat rate of 25%. Income from employment is taxed at a flat rate of 25%. Income up to a certain threshold amount is exempted from taxation. Residents engaged in business in Belize are charged business tax, depending on the nature of their income. Business income includes (1) income from business activities, (2) income from professional activities, (3) rents, royalties, premiums and any other revenue receipts arising from property, (4) commission, royalties and discounts, (5) dividends, interest, (6) winnings from lotteries, slot machines and table games, and (7) management fees, rental of equipment and charges for technical services. Gross rental income is subject to business tax at a rate of 3%. Business tax is due monthly and is generally a final tax. If taxpayers want to deduct income-generating expenses, they can opt to file an income tax return at the end of the tax year. Compute for the total business taxes paid for the tax year. Compute for the income tax payable, deducting income generating expenses from the gross revenue. Compare results. If the income tax payable is bigger than the business tax, the taxpayer doesn´t have to pay the difference. If the business tax is greater, proceed to the next step. Subtract income tax payable from business tax. Use the difference as an expense allowance on the profit and loss statement when submitting the income tax return for the year. Deductible income-generating expenses are as follows: repairs, property taxes, insurance, and mortgage payments. 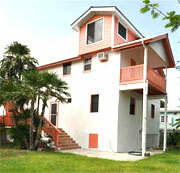 There is no capital gains tax in Belize. Residents pay only 5% stamp duty when purchasing property. Land tax is levied at a flat rate of 1% on all unimproved land located in Belize. Property owners are liable to pay this tax. Property taxes are levied on actual rental income of the property (if it is rented out) or on the assessed rental values, which are likely to be underestimated by the authorities. The tax is levied at 12.5% for occupied properties located in urban areas but the tax rate is levied at 2% for unoccupied properties. In Belize City, property tax on both occupied and unoccupied property may not exceed 2% of the market value of the property.